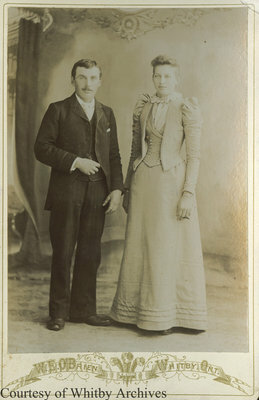 A cabinet card of Joshua Crawforth Smith and Emma Stirtevant on their wedding day, December 7, 1892, in Whitby, Ontario. Joshua Crawforth Smith was born 31 May 1870 at "Bayside" in Port Whitby, Ontario. He married Emma Stirtevant (1873-1927) on 7 December 1927. They had two children: William Franklin Pierson Smith (1900-1986) and John Stirtevant Smith (193-1960). Mrs. Emma Smith died on 7 December 1927 and is buried in Union Cemetery, Oshawa, Ontario. Mr. Joshua Smith died on 2 February 1937 and is buried in Union Cemetery. Smith, Joshua Crawforth ; Smith, Emma Stirtevant ; O'Brien, W.E. Joshua Crawforth Smith & Emma Stirtevant, December 7, 1892, W.E. O'Brien. Whitby Archives A2015_003_005.